Wash potatoes, peel the skin and again wash. Cut into cubes and soak in water. Soaking any vegetable in water prior to cooking fastens the cooking process. Heat the pan and dry roast the spices listed out by adding in order. Once corriander seeds starts to spurt or before it turns dark remove from flame, cool and grind to coarse powder. The speciality of this fry is its aroma. Curry leaves dominates the flavour easing quick digestion avoiding gastric problems also. Serves great to eat with rice, chapathi and can be taken as it is also. 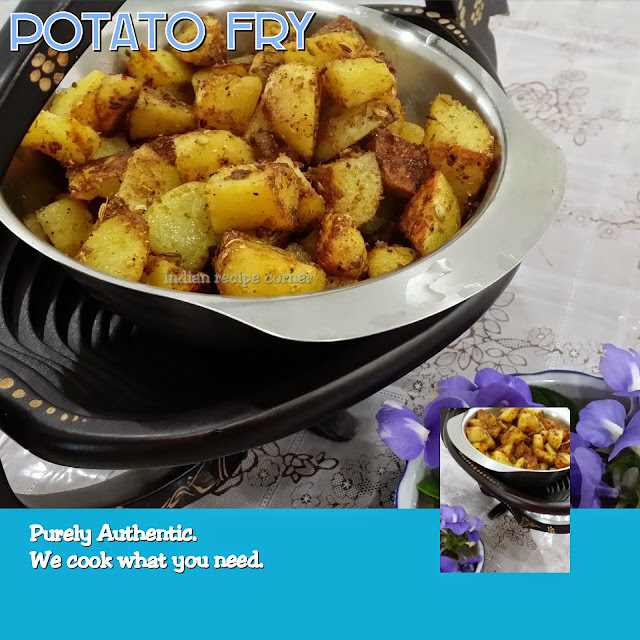 Delicious and lovely looking potato stir fry.